Have you ever wondered what would happen if you got on someone’s bad side? Each personality type has defense mechanisms and talents that they can use to take down an enemy or protect themselves from harm. What are yours? Find out! There are a lot of stereotypes about ENFPs. They are often portrayed as the lovable but disorganized goofballs who always have a smile for everyone. Memes about these types usually include rainbows, unicorns, and confetti. But real, genuine ENFPs are actually a lot more insightful than these memes would imply. They have a sharp antenna for discerning other people’s motivations and expressing those motivations out loud. They get a “gut feeling” when something is good or bad or when someone is being phony or inauthentic. If you’re trying to pull something over on an individual (or a group of people) you’d better hope an ENFP isn’t around to call you out on it. These types may be empathetic and conscientious, but they also have a knack for testing people, revealing their true intentions and making people aware of their own hypocrisy. ENTPs get a thrill from playing devil’s advocate and questioning pre-established rules and traditions. These types are dangerous when they’re underestimated or forced into a corner. In situations like this they can easily unhinge an entire organization by dismantling one small part of it. They easily and quickly notice how complex systems are maintained and how each piece plays a role. They are skilled strategists, able to solve (or create) technical puzzles that will stump even the most analytical mind. ENTPs can undermine a “by-the-books” organization by creating a vision and mapping out very quickly exactly how to create that vision – they don’t care if their security is at risk as a result. These types thrive on risk-taking and uncertainty. They enjoy the thrill of mixing things up and creating chaos in order to find objective truth. INFPs have an innate desire to champion the underdogs of the world. These types aren’t easily dissuaded from their cause and, while they may seem serene and gentle at first glance, they can become fiery and intense if provoked. Pick on an animal, a child, or a disadvantaged human and these types will take you down with a commitment and resolve that defies their ordinarily easy-going nature. They are also not easily manipulated. They tend to resist being pulled into other people’s feelings, instead preferring to stay true to their own feelings and what they truly believe is important in life. Knowledge is power, and knowledge is (usually) something that INTPs have in spades. These personality types absorb data like a sponge and then they look for ways to analyze and critique that data to see how it fits into a larger context. In disaster situations or crisis scenarios they can easily detach from the current situation to find solutions and analyze various angles and leverage points. Finally, they can spot inconsistencies nearly instantly. This makes them dangerous because there is hardly a trap that can contain them that they can’t analyze their way out of. They can mastermind intricate plans of revenge and, if triggered, verbally attack an offender with scathingly accurate, debilitating assessments. Enthusiastic and inspiring, ENFJs are highly aware of other people’s motivations and goals. They can easily tune into the needs, wants, and desires of others and find ways to help them grow and develop. However, while this emotional awareness is usually used for good, they can also use it to obliterate someone’s plans if that person is a threat or if the ENFJ is in an unhealthy/immature state. ENFJs can easily communicate personally to all the people in a group so that they all feel motivated towards one goal. They are extremely persuasive and insightful. Whether they are creating armies, mobilizing people towards a vision, or planting distrust in a group towards their leader, ENFJs can be emotionally strategic for either good or evil depending on their motivations. ENTJs make formidable enemies for a number of reasons. They are excellent at mobilizing resources and supervising the implementation of complex, multi-faceted plans. This means that they can quickly and efficiently come up with ways to dismantle someone they believe is corrupt or ill-suited for their role. Also, if you violate their values, waste their time, or hurt someone they love they can become intensely focused and passionate about your demise. These individuals can instantly objectify their personal feelings and maintain control while they come up with a plan of attack. Finally, ENTJs have powerful insights into what is likely to happen and can use that vision to create a detailed and effective plan of ambush. So yeah, try not to make them angry. Visionary and confident, INTJs are skilled at anticipating far in advance how situations will likely play out. Once they sense how things will unfold, they work backwards to see the most likely trends and how each piece or person played a part. This makes it nearly impossible to hide a plan from an INTJ. They are also more insightful than people realize into the hidden motivations of others. They notice phoniness and emotional manipulation quickly and have no problem calling it out on the spot. Justice and fairness is central to their value system and if someone betrays that sense of justice they can become a daunting opponent. They can quickly organize a plan of attack that is both complex and filled with contingency plans so that it is nearly impossible to avoid. Often gregarious and outgoing, people tend to underestimate ESFPs because they seem so friendly and non-threatening at first glance. However, beneath their smiles and charming humor, ESFPs are quick to pick up on non-verbal cues and relevant data. They are totally tuned into the present moment and are continuously scanning for reactions and details that don’t fit. This makes it easy for them to spot hidden agendas, phony behavior, or unexpected attacks. They enjoy being the first to react to a surprise event and get a thrill from exceeding limits and expectations. 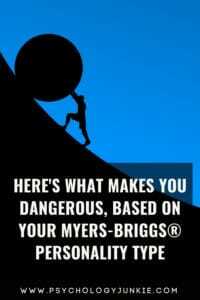 Challenge an ESFP or try to trick them and you’ll be in for a very quick reality check. Incredibly in touch with the present moment, ESTPs are just itching for an opportunity to take down the “bad guy” in any situation. They get a rush from being in action and responding to threats and surprise events. While other people need time to acclimate to incoming danger, ESTPs have a very quick reaction time and can act spontaneously to head off a crisis. Their power isn’t only physical, however. While still in action they can mentally take apart a problem, look at it from different angles, and analyze it to find leverage points where they can combat their enemy quickly. If you try to physically or verbally attack an ESTP they will respond faster than you can imagine. In any debate ESTPs are quick, concise, and keenly aware of their opponents physical and logical weak points. ISFPs are strong-willed defenders of those who they believe are persecuted, oppressed, or disadvantaged. They pair their emotional awareness with a keen attentiveness to what is happening around them in the present moment. While they may seem gentle and easy-going at first glance, they can quickly switch gears and become intense and physically aggressive in defense of someone they are protecting. They enjoy the thrill of action and physical experience and can move quickly to take action in a situation where the values or safety of someone they care about is threatened. They can also quickly spot signs of inauthenticity or hidden motives. This makes them very hard to trick or manipulate. Observant and adaptable, ISTPs tend to be the enemies you never saw coming. Beneath their stoic exterior they are always picking up on relevant data, information, and nonverbal cues. They inwardly analyze situations and events to find expedient solutions to problems. Their detached yet observant insight makes it easy for them to protect themselves from emotional manipulation while also knowing all their enemies weaknesses, tendencies, and tactics. They can use this knowledge to beat their enemies to the punch, surprise them or overtake them physically, or logically dismantle them in an argument. Supportive, interpersonally intelligent, and deeply pragmatic, ESFJs believe in shepherding the people they love and protecting them from harm. Because ESFJs are so protective of their loved ones, and because they have a strong ability to impact the impressions of other people, they can easily destroy the reputation of someone who is a threat or gets on their bad side. They know how to infiltrate social settings and send out a warning about individuals who can’t be trusted. Under duress they can also become physically responsive and impulsive in an attempt to defend or protect themselves from an opponent. Pragmatic and hard-working, ESTJs have a gift for taking charge of situations that are being inefficiently managed. If someone gets on an ESTJs bad side (usually through dishonesty or laziness), they will quickly organize a plan that demotes them to a position worthy of their efforts. They believe in justice and fairness so don’t expect a free-ride with these types. And don’t try to win them over through emotional manipulation or trickery, they have zero patience for it and are easily able to detach from their emotions to see the situation exactly for what it is. Detail-oriented, observant, and careful, ISFJs aren’t easily turned into enemies. They prefer to stay at peace with the world around them and don’t like confrontation or conflict. However, if someone violates one of their deeply-held values or hurts someone they love they can become surprisingly intense and focused in their retaliation efforts. ISFJs are hard to distract from their cause, and they can work in a patient, methodical fashion to dismantle every detail of their enemy’s plan. They can also quickly scope out emotional weaknesses, hasty mistakes, and bad habits that they will use against their enemy. Focused, logical, and quick to notice patterns and inconsistencies, ISTJs are the enemy you never saw coming. At first glance they seem reserved and down-to-earth, not particularly intense or combative. But the more time they spend around people the more they pick up on hidden weaknesses, habits, motives, and tendencies. If someone poses a threat they can quickly turn their enemy’s defects against them while patiently composing the perfect scheme to render their plot ineffective. Did you enjoy this article or hate it? Let us know your thoughts and insights in the comments below! Want to find your child’s personality type? Take our Parenting by Personality eCourse!